OLD DETROIT SKATING CLUB photo print photograph picture for sale. OLD VINTAGE HISTORIC DETROIT SKATING CLUB 1949 photo print picture photograph poster for sale. This is a professionally restored sepia toned black and white OLD DETROIT SKATING CLUB photo print picture for sale which was made from the original vintage black and white 1949 OLD DETROIT SKATING CLUB photo. It has been professionally restored. Some of the very thin vertical lightly cracked emulsion lines which existed on the original 70 year old photo still slightly show in this sepia toned photo print. 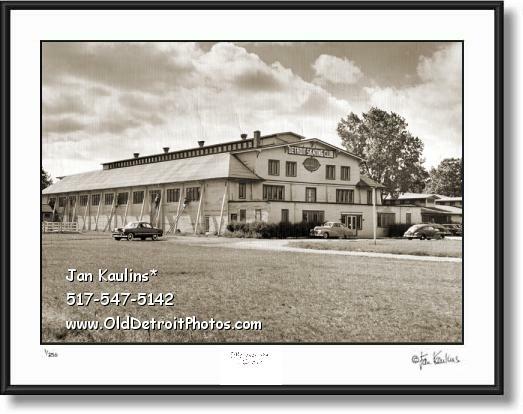 It, however, does not diminish the historic uniqueness or beauty of this very rare historic Detroit Skating Club 1949 old photo print for sale.
" Figure skating in Detroit was in its infancy around 1910. Skaters could be found on the lakes, on Belle Isle and on the small artificial rink of the David Brown Company alongside their coal and ice plant in downtown Detroit. But this rink did not last and the "fancy" skaters were soon in trouble because of the stiff breezes blowing from the lake.In the meantime, David and Harry Brown erected a modern ice rink. The Arena, and a few enthusiasts under the leadership of Gladys Salsinger organized a real figure skating club. The club prospered and began to develop some good skaters until the First World War brought the close of the Arena by government orders. Luckily, the Detroit Tennis Club has some skating addicts who saw to it that the courts were sprayed in the winter and could be used for skating by our group, who became winter Tennis Club members. After the War was over, some local enterprising young men built the "Olympia Stadium" and our skating group under the leadership of Mrs. Salsinger, formed a new club, "The Olympia Skating Club. "The Olympia Skating Club went ahead and held carnivals, featuring such outstanding amateur skaters of their time as Sonja Henie, Pierre and Andrea Brunet, Papez and Swack. But due to their fast decreasing ice time, the group was finally forced to reorganize. By 1946, the members were able to purchase a facility, previously used to house the horses of automotive magnate Charles T. Fisher and call it home. In 1949 the Club changed its name to "The Detroit Skating Club, Inc." This rare historic old vintage DETROIT SKATING CLUB photo was taken in 1949, just after the opening of this Detroit Skating Club. The Detroit Skating Club grew in size and stature, many Olympic and World Champions were developed here. The expanding world of figure skating demanded a larger facility for the Club. In 1978, the club took the opportunity to move to its present location in Bloomfield Hills. " (Thanks for info per DSC website.) This is a wonderful historic photo showing some of the early roots of this Detroit Skating Club that has turned out many national and international champion fine skaters.